Fort Pulaski was a coastal defense fort located in Coastal Georgia for the United States. Named after the Polish-born officer Kazimierz Pulaski, who fought in the American Revolutionary War under George Washington, the fort is located in Chatham County on Cockspur Island, at the mouth of the Savannah River, which forms the border between the states of Georgia and South Carolina. The fort has been designated as a national monument since 1924 and is under the administration of the National Park Service. It was added to the National Register of Historic Places (U.S. National Park Service) on October 15, 1966. As part of the necessary defense measures with regard to the impact of the British-American War of 1812, the US government chose to protect the important ports and coastal areas of the country through permanent fortifications against enemy attacks. It was therefore decided to build a fort at the mouth of the Savannah River, which was to close the estuary and the port of Savannah. Construction began in 1829, first under the leadership of Major Babcock, then later under Lt. Robert E. Lee, a graduate of the United States Military Academy. Because of the marshy ground, it was necessary to build the fort on stilts. The oak trees used for this purpose reached a length of up to about 23 meters. After 18 years of construction, the fort was completed in 1847 and had devoured the enormous amount of one million dollars at the time. 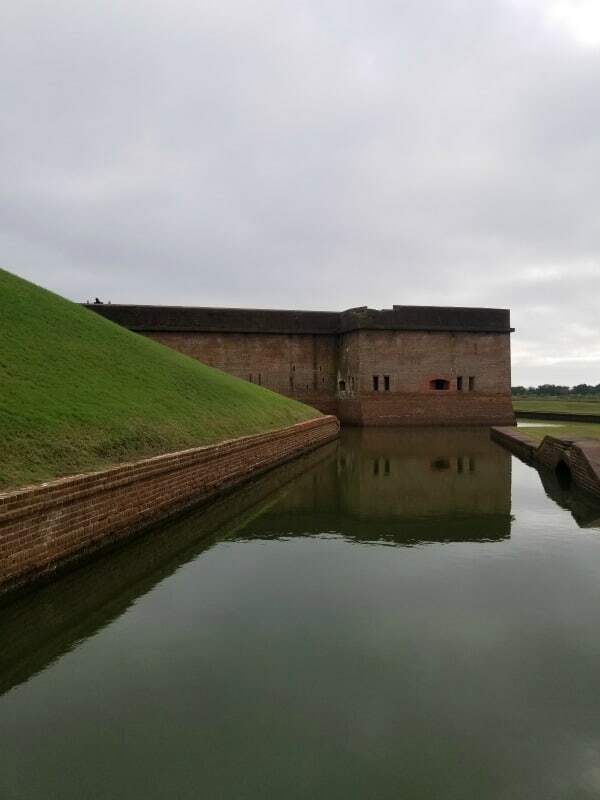 In 1833, during the construction phase, it was decided to give the fort the name Fort Pulaski. The fort is surrounded by a 16 meter wide and about 2.5 meters deep, wet ditch (moat). The ramparts reach a height of about ten meters with a total length of 526 meters. After further development, the governor of Georgia at that time, Joseph E. Brown reclaimed the fortress for his state. Unauthorized, he deployed a 110-man commando from the Georgia Army National Guard on a steamer march. This detachment held the fort for the state of Georgia until February 1861, when the Georgia Army National Guard was replaced by regular troops of the Confederate Army. In December 1861, the Confederate Army decided to give up Tybee Island, south of Cockspur Island, because of its isolated and ill-served location. On the morning of April 10, 1862, the fort was demanded to be handed over to avoid unnecessary human losses. Colonel Charles H. Olmstead rejected this request. At about 10 o’clock in the morning, the Northern States troops opened fire with 36 guns against the right flank of the fort. For the first time, they also used James Rifled Cannons and Parrott rifles. After a continuous fire of 30 hours, a breach was made in the southwest corner of the fort, leaving the main powder magazine in the immediate firing range. The commander then hoisted the white flag. Within six weeks of the capture, the Northern States had repaired the fort and used it for their own purposes, meaning that the port of Savannah could no longer be hit by blockade raiders, causing a serious setback for the Southern states. At the beginning of the 20th century, the building began to show signs of deterioration. To counter this, President Calvin Coolidge, on 15 October 1924, proclaimed Fort Pulaski as a National Monument. On August 10, 1933, responsibility passed from the War Department to the National Park Service, which immediately began restoration work with members of the Civilian Conservation Corps. At the beginning of the Second World War, the fort was closed to the public and used by the US Navy as a base. After the end of the war, the fort returned to the National Park Administration and was incorporated into the National Register of Historic Places on October 15, 1966. 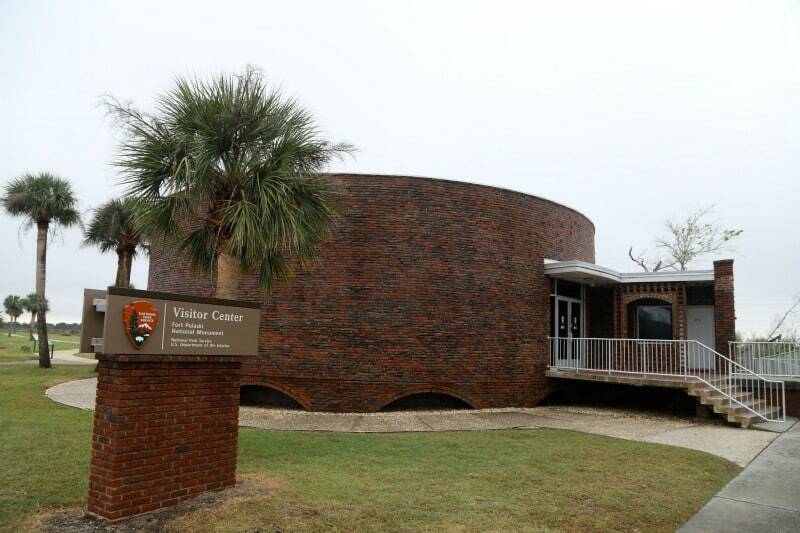 The Fort Pulaski Visitor Center is the perfect place to start your visit to this great park. 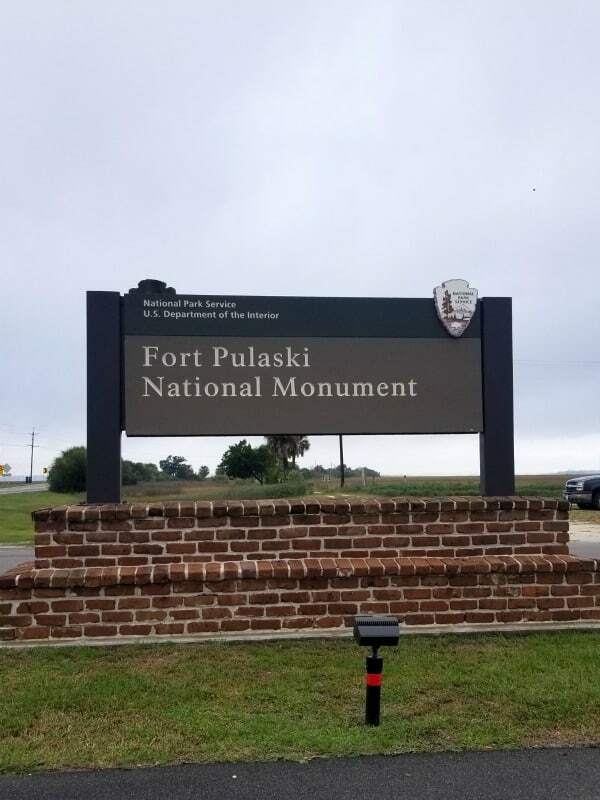 There are exhibits on General David Hunter and Robert E. Lee, the construction of Fort Pulaski and the significance of the battle for Fort Pulaski in April 1862. You can also check with the volunteers or Park Rangers if you have any questions about the park. The Battle for Fort Pulaski a 20-minute film highlights the history of Fort Pulaski from its early construction to the later struggle for its control during the Civil War. Film shows on the hour and half-hour from 9:30 AM to 4:30 PM daily. 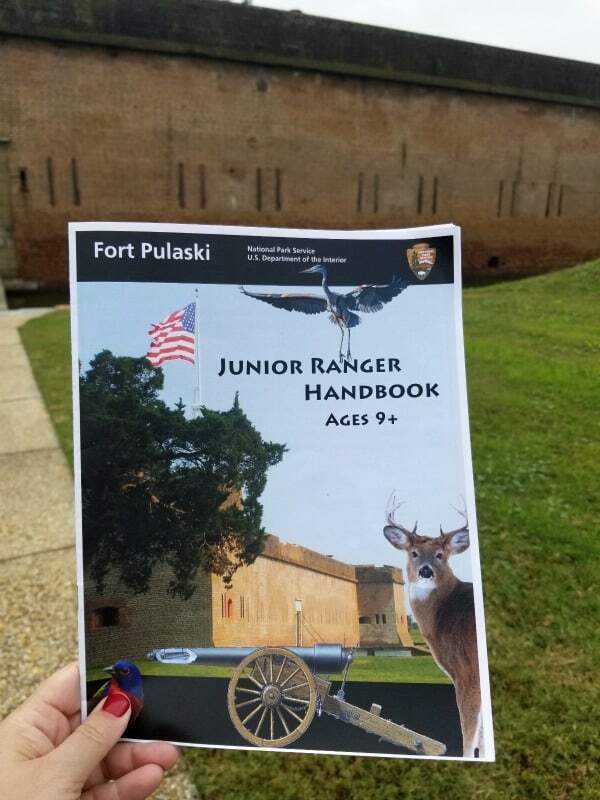 The Fort Pulaski Junior Ranger Program is a fantastic way to learn more about the fort and the history of the area. 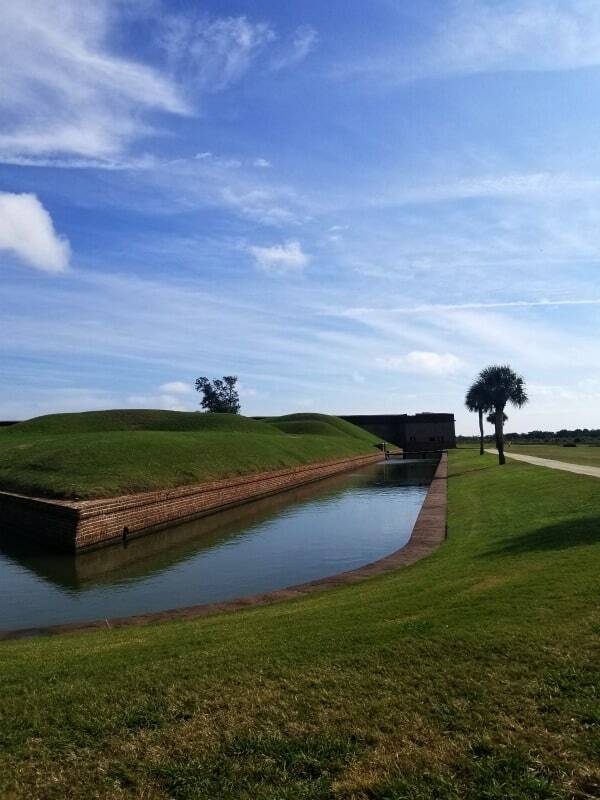 Explore one of the seven trails that surround Fort Pulaski NM! You can even earn a Fort Pulaski National Monument Trail Adventures Certificate for hiking all of the trails. Make sure you know the weather and plan accordingly. Bring sunscreen, insect repellent, a hat, sunglasses, and a water bottle with you on the trail. 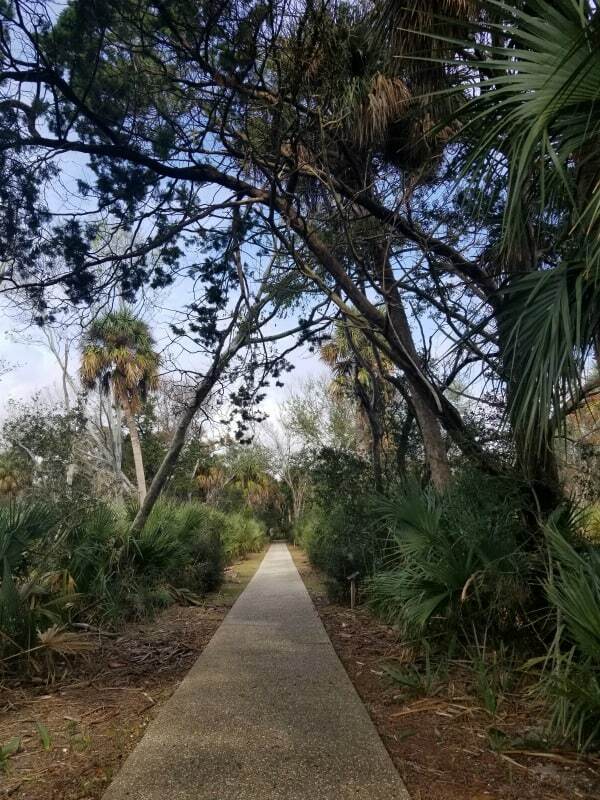 This short trail guides you past remnants of Fort Pulaski’s original construction village, Battery Hambright, built in the late 19th Century, and the historic north pier. 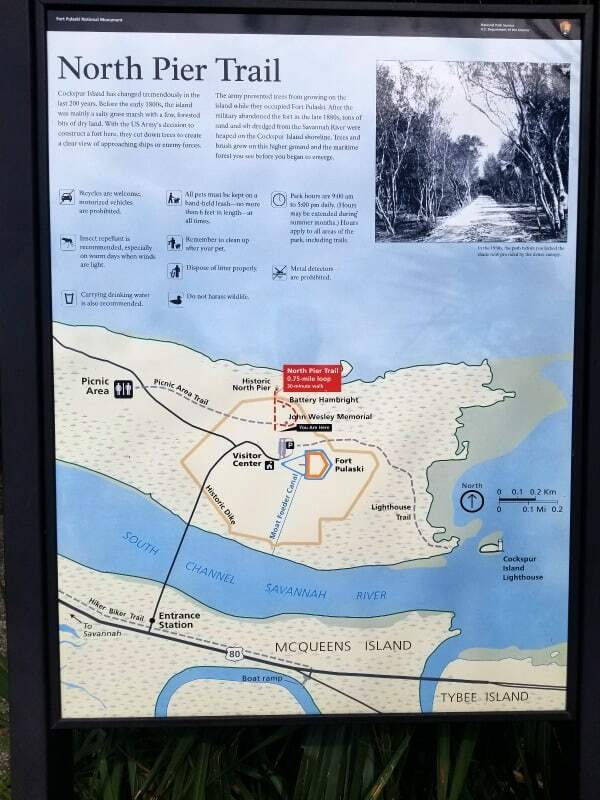 Start at the visitor center and walk around the perimeter of the fort. This trail takes you along open marsh areas with views of views of the Savannah River, and Tybee Island. 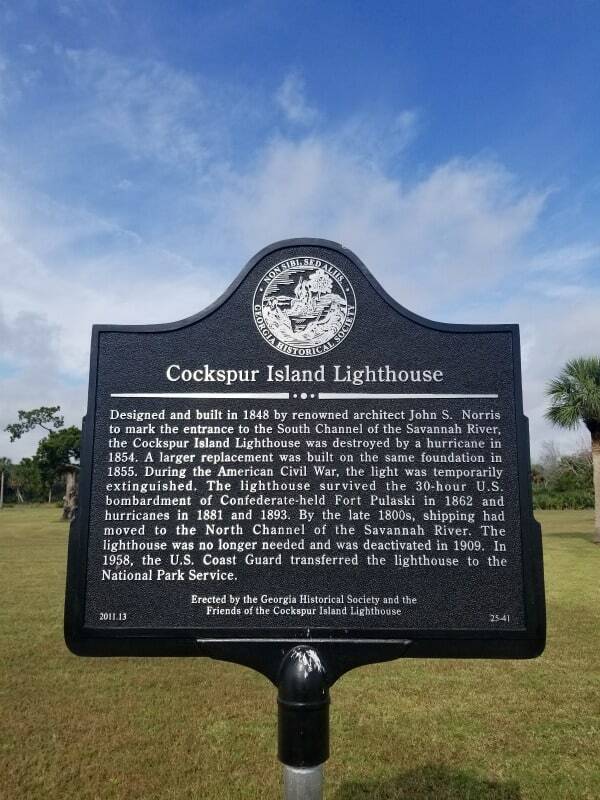 This trail offers the best opportunity to view the historic Cockspur Island Lighthouse. 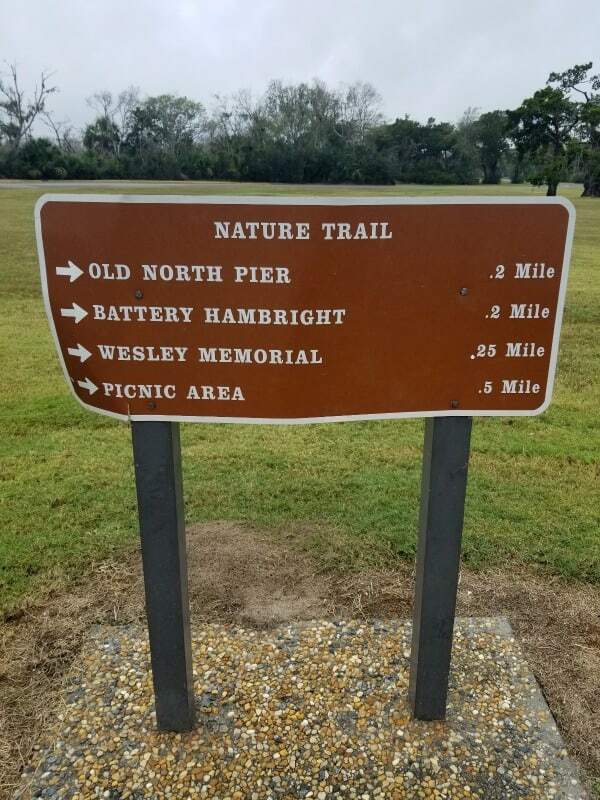 This trail starts at the visitor center and takes you out to the Battery Hambright. From the end of the North Pier Trail, you can see Turtle Island, Daufuskie Island, Hilton Head, and the Atlantic Ocean. This trail starts at the visitor center and guides you through the woods to a great picnic area. The Historic Dike System was designed by Robert E. Lee. The dike system allowed for tide control to help with the building of Fort Pulaski. 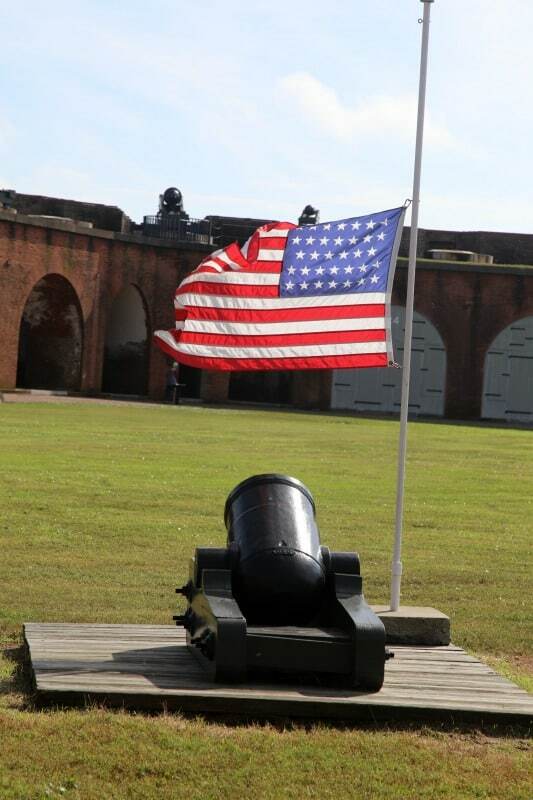 Fort Pulaski National Monument is open year round from 9:00 a.m. to 5:00 p.m. The Visitor Center is open from 9:00 a.m. to 4:30 p.m.
Fort Pulaski Entrance Fee – Per Person (16 years and older) – $7.00 valid for 7 consecutive days. 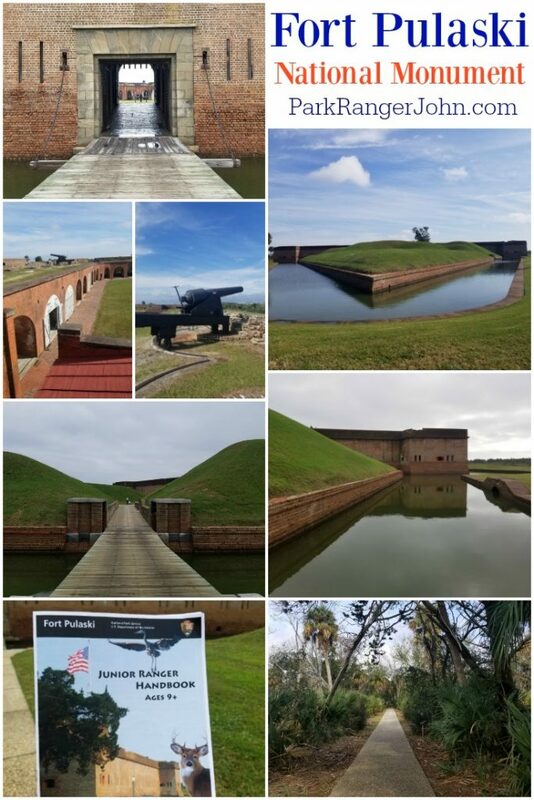 The Fort Pulaski Annual Pass covers the pass holder and three additional people for admission to the monument for one full year. While your pet is welcome in the monument, pets are not allowed in public buildings. Pets must be restrained on a leash no longer than 6 feet long and may not be left unattended. Check out all of the great National Parks in Georgia and neighboring South Carolina National Parks.